Brandon Johnson, a longtime organizer with the Chicago Teachers Union and an Austin resident, took an important step Monday to run in the March Democratic Primary against Cook County Commissioner Richard Boykin for the 1st District seat. 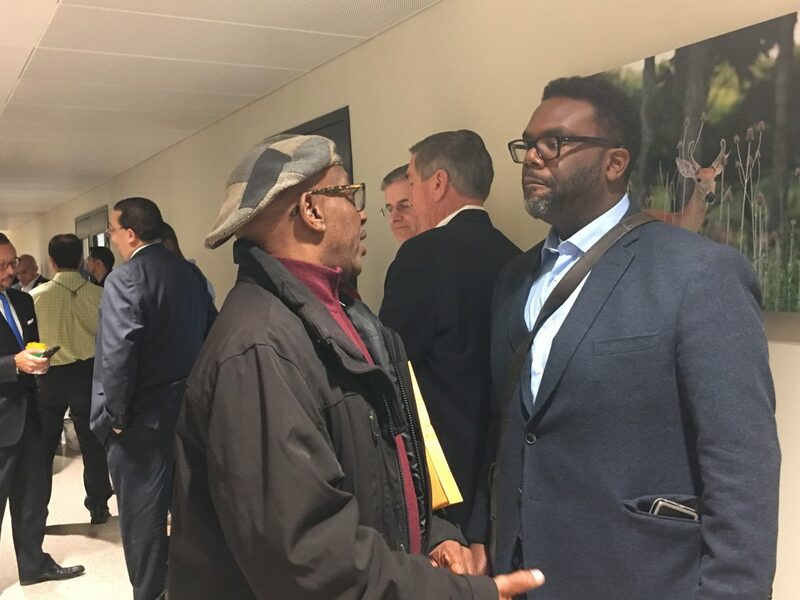 Johnson filed more than 2,100 petition signatures at the Cook County Clerk’s office in hopes of securing a spot on the March 20 ballot. “I am thrilled for this big-suit, broad coalition of support that we have,” Johnson said Monday morning at 69 W. Washington St., where dozens of political hopefuls and incumbents turned up on the first day to submit nomination petitions for next year’s primary race. “There’s obviously a lot of room in the district for a teacher and an organizer to represent the interest of the working-class families,” said Johnson, who arrived at the county clerk’s office with a couple campaign staffers Monday at 8 a.m., an hour before the office opened. “Richard is committed to cutting services and jobs, protecting the interest of big corporations and the wealthy,” Johnson said, referring to the approximate 330 layoffs and the elimination of over 1,000 open positions in Cook County, mostly in the county sheriff’s and judicial offices. The cuts, which was included in the 2018 county budget proposed by Board President Toni Preckwinkle and unanimously passed by the board last week, is intended to fill a $200 million revenue shortfall caused by the successful repeal of the controversial sweetened beverage tax led by Boykin. Johnson said his priorities as the 1st District commissioner would be health care, criminal justice reform and job creation. “We’ve been standing up for working families for the last three years since I’ve been here,” he said, citing his sponsorship of the minimum wage increase and paid sick leave, on top of leading the efforts to repeal the regressive soda tax. Boykin noted he has not missed one vote or board meeting since he took office in 2014, while saying Johnson has been absent from the county affairs. The county workforce totals about 22,000, and criminal justice reforms have reduced the jail population from 10,000 to 6,500 a day, he noted; he said eliminating 1,ooo vacant positions will save taxpayers $52 million a year. Johnson said he is going through the endorsement process with the CTU and has gained support from the United Working Families. UWF has helped organize his campaign, Johnson said, adding he is also on track to seek support from other labor leaders. “We’ve already secured some financial commitments from families who live in the district,” he said. Johnson, who worked as director of constituent services for state Sen. Don Harmon from 2003 to 2004, said his experience as an educator, public servant and organizer would help him take on county issues, noting he has worked on closing corporate loopholes, statewide fundraising and promoting Democratic causes. “Brandon is a well-known community organizer, fighting for education issues for years,” Stephanie Gadlin, communications director for Johnson’s campaign, said. “He’s a great teacher, a father, he’s very active on the West Side and throughout the district,” said Gadlin, who served as chief spokesperson for the CTU and its president, Karen Lewis, until last year. In late September, Boykin announced his re-election bid and the endorsement of several West Side ministers and elected officials, including Congressman Danny Davis, Ald. Emma Mitts (37th) and Ald. Chris Taliaferro (29th), AustinTalks reported. Here's to a healthy, prosperous 2018! AustinTalks wishes each and everyone of you a wonderful new year. Thank you for your support and encouragement in 2017. We look forward to our ninth year of operation.